Book hotel rooms online with us at Vila Vita Parc Resort & Spa Hotel at the lowest rate, guaranteed. Get your holiday discount room rate at the 5 Star luxury Vila Vita Parc located in Alporchinhos just to the west of Armacao de Pera in the western Algarve. 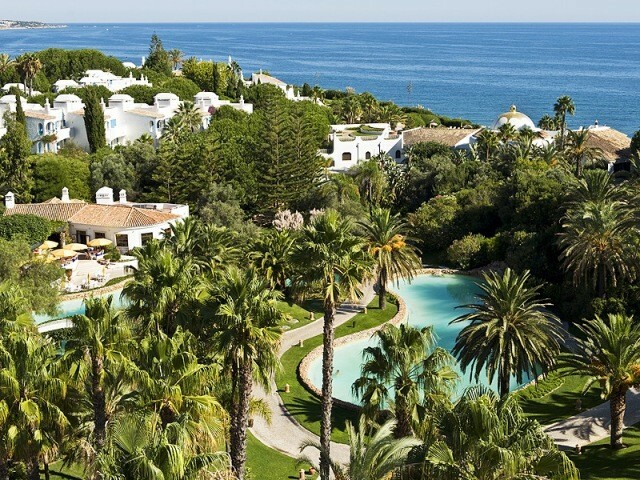 The resort with its 54 acres of gardens is perched on the cliffs and has direct private access to the beach. Within the air-conditioned guest suites and apartments there is accommodation for 360 persons including guests with disabilities. They are all spacious and well decorated with modern comfortable furnishings. The accommodation provides holiday accommodation from 2 to four adults. The Vila Vita Parc has a Wellness Spa with a fine indoor pool, massages and beauty treatments, sauna and massage, an ice room (-3Ai��) and a relaxation room. All the 180 rooms have terraces or balconies and are equipped with satellite TV, phone, radio and CD-Player, Wi-Fi and mini-bar. Vila Vita Parc has many facilities including its Spa, a gourmet restaurant which received its 2nd Michelin Star in 2011, 8 other restaurants, 5 bars, outdoor pools, a Fitness Centre, a Kids Club in season, a Business Centre, direct path access to the beach, beauty salon, mini-golf, 9-hole pitch and putt course, putting green, petanque, games room and tennis courts with coaching. To add to the luxury nature of the Resort it maintains a 72 foot yacht which may be hired for sailing along the attractive Algarve coast.